Yes, it's not Piso Fair but it's Piso PAIR. Buy one ticket for 99 pesos and get the other one for the same route at 1 Peso. 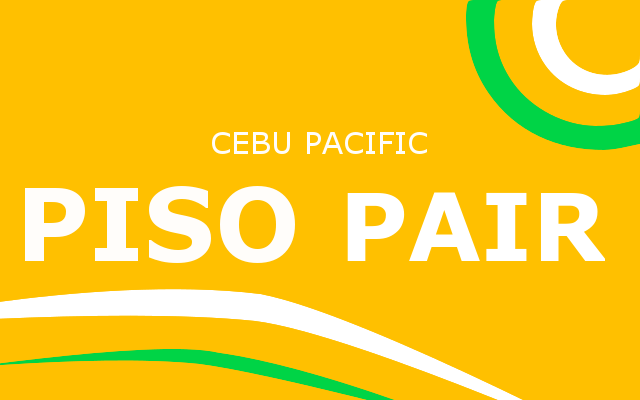 This is the latest promo announced by Cebu Pacific. Promo period is until tomorrow, July 17, 2018. The travel period is from January to June 2019. If you have plans of travelling next year, then it's high time to book your flights. When you book using the website or through mobile app, use the promo code PISOPAIR. Cebu Pacific is the largest carrier in the country. In addition to domestic routes, it also offers direct flight to many Asian destinations as well as to Australia and Middle East. On July 1 this year, the much awaited and anticipated opening of the second terminal of Mactan-Cebu International Airport (MCIA) finally happened. The team up of GMR and Megawide has successfully constructed this new facility effectively de-congesting the country's second busiest airport. In 2017, MCIA recorded serving 11 Million passengers. Aside from capacity, this new terminal boasts modern and stylish design that will attract people to spend more time in it. The concept is a resort-airport where people will be able to relax and have fun while waiting for their flight perhaps during a long stopover. This new features will come with a cost though. Already the most expensive airport in the country with terminal fees currently running at 300 Pesos for domestic and 750 Pesos for internal flights, MCIA seeks to increase the international terminal fee to 850 Pesos. I just like the helpful information you provide on your articles. I will bookmark your blog and check once more here regularly. I am relatively certain I’ll be informed lots of new stuff proper here! Good luck for the next!